Belle Ami has outdone herself with this, the second book in her Tip of the Spear series. This is no lighthearted romance. Belle tackles timely yet difficult issues head-on – terrorism, a threat to all in our world today. Yet she counterbalances the fear and horror with a moving tale of deep, true love. Fast-paced, a real page turner, I highly recommend Vengeance if you’re looking for a novel for our times that helps you see the light at the end of the blackness. Claire Gem is an award-winning author of contemporary romance, women’s fiction, & supernatural suspense. Find out more at her Website or Amazon Author Page. 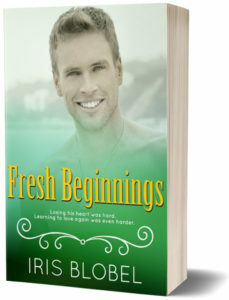 Welcome Iris Blobel to Ghost #BookHugs! Claire Gem is an award winning author of contemporary romance, women’s fiction, and supernatural suspense. Visit her Website or Amazon Author Page to learn more. Workout Your Brain with Books! Some of my friends exclaim, “I don’t know how you can do that! If I tried to read more than one book at a time, my brain would explode.” Well, since I do perform this brain-multitasking feat on a daily basis, I thought I’d do some research to determine whether it really was hurting—or helping—my cognitive abilities as I age. Information, other than individual opinions on the subject, was difficult to find. Of course, any search including the term “multitasking” brings up a plethora of negative articles claiming how dangerous this can be, like texting while driving. “Split-focus” was another term I came across often, which, it is claimed, reduces focus and productivity. I even found several bloggers who claimed it was a disgrace to “cheat” one, wonderful book out of your full attention. I also learned a brand-new term for the habit: “poly-reader,” as opposed to a monogamous or serial reader. Wow. I didn’t know reading more than one book at a time placed me in the non-monogamous category. So…I’m cheating on the first book with the second and third? Or is it more like polygamy, where all the books willingly consent to share my attention? Then there’s the question of multiple media: print book vs. eBook vs. audiobook. Can you mix these without the dose becoming lethal? I say these theories are hogwash. First of all, I not only have at least two or three print books on my nightstand at all times, but I also have a Kindle app on my phone (I know, this is really bad for my eyesight. But that’s a subject for another blog…). Since I’m also a huge fan of audiobooks, I virtually never listen to music on my car radio. I’m always listening to a book. Researcher Stanislas Dehaene studied people’s brain waves under fMRI, and concluded that text in a familiar format, i.e. the printed page, stimulates the ventral reading pathway. This allows the reader to decipher and understand the content effortlessly. When the format changes, however, as text on an eReader or computer screen, another part of the brain is triggered: the dorsal pathway. This is the more simplistic, basic process, and the way we all learned how to read—by sounding out the syllables. So, how can this be bad? We exercise our bodies in multiple ways, don’t we? It seems to me that exercising our brains in multiple ways can do nothing but help keep our minds in shape—and sharp. Then we move on to the third medium: audiobooks. Now we have a whole different set of cognitive processes going on. I found some sources that claimed listening to an audiobook vs. reading one was “cheating.” The foundation for this theory is that listening turns an active process into a passive one. But the author of this article on The Science of Us, Melissa Dahl, disagrees. She cites this: “a study from science writer Olga Khazan, noted in 2011, (that) a “1985 study found listening comprehension correlated strongly with reading comprehension.” So, no: Listening vs. reading isn’t cheating. It’s just absorbing the information via a different sensory route. Again, how can this be bad? By listening to an audiobook, we are utilizing yet another part of our brain. Exercising it. Exercise = good. But now, the real question: what about us poly-readers? For those of us who not only partake of multiple forms of reading material, but more than one at the same time? Are we breaking some moral code? Are we totally overloading our brains and running the risk of burning out a neural pathway? And finally, in this wonderful article on AgileLifestyle.net, author Tony Khuon describes this kind of voracious reading as “more like a superpower.” Since 2012, he has consistently reached his goal of 150 books in one year. He recommends, when reading books in parallel, to select three different kinds of books, i.e., a genre novel, a literary work, and a nonfiction title. The book(s) on my bedside table are nonfiction, craft books that help me to improve the novels I write. The book on my Kindle app is a genre fiction, usually one a fellow author has asked me to read and review. The audiobook booming out from my car’s speakers on my commute is usually a literary title, or a classic. I turn sixty in just a few short weeks. So far this year, I’ll bet I’ve “consumed” almost a hundred books in their various formats, though I haven’t kept count. Do I feel sharper, and smarter, and more motivated? Yes, indeedy I do. I walk, do yoga, and ride a horse to exercise my body, and I read—profusely and diversely—to exercise my brain. Are you monogamous or a poly-reader? Do you enjoy books in multiple formats, or primarily one? I’d love to hear your thoughts in the comments. Claire Gem is an award-winning author of contemporary romance, women’s fiction, & supernatural suspense. You can find out more about her & her work at her website or on her Amazon Author Page.